AFI is founded in the spring of 1979 by Eva Cheiladaki, Ann Citron, Donna Coson, Corinna Politi-Coutouzi, Patrick Coutouzis, Maria Grigoriou and Yiannis Papadopoulos as a collective of ‘joined forces and skills’. The group sets out to create contemporary crafts using traditional techniques, and to encourage other artists’ pioneering work. After organizing exhibitions of their work in various galleries. 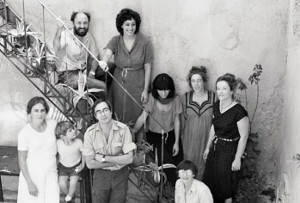 the group opens its own space, the AFI Center, at 25 Tripodon St., Plaka, in March 1983. There it presents exhibitions (featuring work of its members, or of invited artists, exhibitions on specific themes), lectures, seminars, courses in technical skills, a series of exchanges with equivalent groups from other countries, etc. Over the years, other artists join the group: Despina Politi, Inger Carlsson, Meredith Green, Yorgos Polyzos, Despina Pantazopoulou, Theodora Chorafas and Judith Allen-Efstathiou. The AFI Center (1983-1989), a non-profit cultural organization run and financed by the group’s members, with the exception of two subsidies from the Ministry of Culture. Since 1989, AFI exhibits in other art spaces. After thirty years of collaboration, AFI members, Judith Allen-Efstathiou, Inger Carlsson, Eva Cheiladaki, Theodora Chorafas, Corinna Coutouzi, Maria Grigoriou, Despina Pantazopoulou and Yiannis Papadopoulos. continue to work creatively together. The AFI collective was founded on two basic principles: mutual esteem for the excellence of each member’s artwork and strong bonds of personal friendship between members. This has resulted in the rare longevity of the group. The 8 members have each developed their individual artistic creativity and expression, ingreat part due to the encouragement and support of the collective. AFI remains avant-garde and modern in the sense that members highly value attention to technical skill and absolute quality while creating work which reflects contemporary issues.